> Research Library > Foxit > Time for a Fresh Look at Your Document Management Strategy? 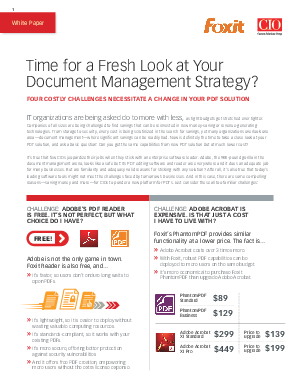 Time for a Fresh Look at Your Document Management Strategy? IT organizations are being asked do to more with less, as tight budgets get stretched ever tighter. Companies of all sizes are being challenged to find savings that can be reinvested in new money-saving or revenue-generating technologies. From storage to security, every cost is being scrutinized in the search for savings, yet many organizations overlook one area—document management—where significant savings can be readily had. Now is definitely the time to take a close look at your PDF solution, and ask a basic question: Can you get the same capabilities from new PDF solution but at much lower cost?